At a Sunday night service in India there were around 800 kids from a variety of backgrounds and situations, from being orphans to belonging to wealthy hindu families. We decided to activate all 800 in healing, ages 3-17, and hundreds were instantly healed when their friends laid hands on them! A young man had broken a chunk out of his kneecap in an accident, so there was a noticeable piece missing. During ministry time at New Hampshire church, God replaced the missing piece in mere seconds! A number of people were missing cartilage in their knees, causing painful bone-on-bone friction. For each one of them, God instantly filled in what was lacking! They testified that they could feel it sliding in and all the pain was gone! Jesus is amazing! If you need something replaced or recreated in your knees, simply thank God for what He has done and receive your miracle from Him today! Saturday night Joel had a dream where a man named Emmanuel asked him to go to a specific church in Tijuana and preach Sunday morning. The next morning we actually ended up there to minister. During the service, a homeless man walked in off the street. He had been involved in a personal relationship with satan for years, but Friday night he had been at an open air crusade that our team did downtown. Sunday morning a voice in his head told him to walk to a specific neighborhood a long ways off, and gave him turn by turn GPS-style directions until he ended up at the church where Joel was preaching. He recognized us from the crusade and gave his life to Jesus, breaking the oath to satan! He decided to join that church and attend bible studies to learn as much as he can. The church is also helping him back on his feet. Wow JESUS!!! Laci preaches powerfully to a crowd (not pictured) on the Spirit of Adoption. Laci, Joel, and some friends on the team began to open-air preach in a plaza in Tijuana. Around 20 people were born again and several received instant physical healing from Jesus! Many felt the presence of the Lord and wept as they felt His deep, deep love for them. 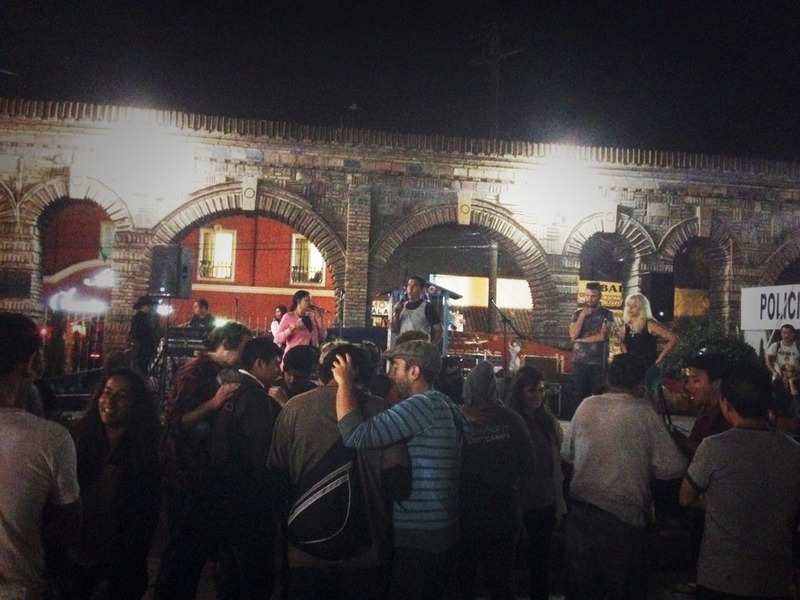 We held an open-air crusade in downtown Tijuana on a Friday night. Our friend Naomi and I led the event, with others preaching briefly, giving testimonies, and singing songs. God moved in incredible ways! Some of the Mexicans were laid out under power of God right there on the concrete. Uncounted numbers of people were divinely healed of a wide variety of conditions, as well as many others who received Jesus as their Lord and Savior that night. One man literally ran to the front after hearing the Gospel preached. He waved both arms emphatically in his desperation to receive Jesus, weeping openly, then began jumping and pounding the pavement in the ecstasy of his salvation. After that moment, they prayed for him to be filled with the Spirit of God. He crumbled in the weight of His glory, weeping with his face to the pavement. Later on he came to the stage to share his testimony. Never having believed in Jesus before, he had been on his way to work, heard the Gospel, and felt “Something amazing, something like the embrace of a good Father.” Many people encountered this Father that night. Prostitutes, drug addicts, drug lords, murderers, thieves, and satanists heard the Good News that God was in Christ, reconciling the world to Himself! This woman was supposed to be waiting for surgery on her knee. She was required to wear a knee brace at all times and experienced a good deal of pain when she walked, in spite of the brace. After receiving prayer she took off the brace and found herself dancing around the room, caught up in the joy of God’s presence. After a while she realized that she had no pain for the first time in years! She had longed to dance again but had been unable to for a long time. Her joy overflowed as she realized what Jesus had just done for her. No longer needing the brace, she put it away in her purse and walked away completely pain-free. God is amazing! As we were leaving a large Russian Orthodox cathedral in St. Petersburg, we met a homeless man begging outside. He had a cane. We asked if we could pray for him, and with his permission we laid hands on his leg. He began to weep as the Lord touched him. Our friends got his number and gave him the contact information for a local rehab center. After a few minutes of being overwhelmed by God’s love for him, he exclaimed that his leg was completely healed and he had no more pain. As the seemingly eternal light of the northern summer sun embraced the great stone columns of the cathedral behind, he stood with happy, stunned gratitude at the way God had come to him so unexpectedly. Two men in a Russian rehab clinic near the Finnish frontier had been wounded by bomb blasts in separate countries, during separate wars. One man, while fighting in Chechnya, had a piece of shrapnel go through his abdomen and strike his spine, permanently injuring his back. He’d had pain ever since. The other man caught shrapnel while battling in the Russian conflict with Afghanistan. The piece of metal knocked out a vertebrae from his backbone. The doctors replaced the missing piece with an artificial one, made of metal or plastic. It pained him ever since. During ministry time at the rehab clinic, brave men and women laid hands on each other for supernatural healing. Many people were instantly healed of various ailments, including these two men. God touched both of them and they can’t find their pain! In an open-air meeting at a small village, a number of people were healed as they simply listened to the Gospel being preached! Nobody laid hands on them or prayed for them in any way. Jesus' work on the cross, His death, burial, and resurrection were proclaimed, and God's miracle power came tangibly through the message. One woman had an excruciating stomach condition. It was so painful that she often was unable to walk at all, let alone go on a bumpy bus ride. She lived in another village, and didn't think she could make it to the outdoor meeting. Her friends wouldn't hear it, encouraging her to push through the pain and let them help her get there. They had faith that a miracle awaited her. She agreed, and with their help she came and joined the crowd awaiting a touch from the Healer. As the hot sun beat down, she sat, simply listening to the Gospel. When she heard the Good News of what He'd done, God came and touched her body, completely delivering her of pain and sickness! Nobody but the Holy Spirit had laid hands on her. She joyfully stood, announcing to the crowd what Jesus had just done as tears filled her eyes. As the day progressed, many others received divine healing from the Lord and some received His salvation for the first time! Indigenous, first-generation Jesus followers lay hands on the sick, seeing the healing power of God move through them. Five years ago a woman in a village fell on her back. When we met her in the village recently, the muscles on the right side were now bulging, forming somewhat of a hump. The left side was caved in, having almost no muscle. After prayer, her back was completely even. The hump instantly flattened out, and new muscle now filled the area where there had been none! Jesus Christ is still the Creator and Healer! Laci had prayed for a woman that pain would leave her legs and ankle. The woman ended up encountering Jesus radically at the time, as Jesus came and stood in front of her. Laci sent her home and had told her that God was going to encounter her and heal her body Himself. This past week, we revisited that same fellowship and the woman came up to Laci and said she had never been the same since that night. Apparently, after she went home that night, God took her into a long trance where she shook on the floor for almost half an hour- she had never experienced anything like that before. Every night she had to wear shin braces to sleep because of the problems with her legs. But, a couple nights after her trance experience, she felt that God said she didn’t have to wear them anymore. As she lay in bed, she felt electricity shoot through her body and the pain left her legs that night. Months later, she is still completely pain-free and sleeping without braces- for the first time in years! The Holy Spirit is moving among the Buddhist temples and monasteries. Frequently somebody will be healed and in a flash we are surrounded, forcefully pulled and jostled by those seeking a touch from God. Many are healed, and the Good News of Jesus Christ is joyfully received by pilgrims, monks, and beggars! Biking through striking blue-green karst mountains, I breathed in the sweet smell of orange blossoms and wet soil, the sun embracing my back as I pedaled. "Trees laden with ripe fruit. Straw hats and baskets. SUNSHINE. Smells of spring, breeze of fall." I've been learning to live fully present and glimpse God in every moment and it mostly comes out like thankfulness. The appropriate response to seeing God is awe and thanks. We pulled up to a lot where we would board a boat to take us across the river. Just dismounting our metal steeds, a grey-haired woman, bent from many years of farm work, hobbled to us with fruit to sell. Enveloped in the moment with Holy Spirit, I felt to ask if she had pain in her knees. Yes. Could we pray for her? Yes. I laid my hands on her knobby knees and simply said, "Pain go, in Jesus' name." She grinned a two-toothed smile and began to test out her knees. Suddenly, like the dinner bell had been rung, fruit-vending women rushed to feast on what God was giving. Patting backs, pointing to shoulders, exposing sore joints: where was God in this moment? Healing his girls. A woman with shoulder pain- instantly healed. Back pain? No problem. The sweet mountain-backed woman who first approached said her right wrist was numb. Sitting on the pavement, she held her weathered, worked hand to me. I've seen Jesus a lot in my life, mostly his eyes. One of my regular prayers is that I would see him in flesh in front of me; drink in his face, inhale his fragrance, touch the skin of the man I love. In the eyes of the husband I cherish, in the smile of the beggar on my street, I've seen him. How many times have I passed him on the street, eager to wish the present moment away, unable to see because of my own ungratefulness for every new breath and every second of life? Too many times. Every moment is pregnant with kisses from a beautiful God, and it is my journey of wonder that leads me to never let one miss my lips. I took her hand and looked deep into her life-filled eyes, smiling as close to ear-to-ear as I could. I knew then that it was one of those moments where Jesus inhabits my eyes for someone else. She broke out in laughter and held gaze with me. Jesus healed her in that moment and wrists felt touch, hearts were filled. We spoke of their healer, told them about his love in our broken understanding of their language. They could feel it and faith nodded their heads to agree as we held them and repeated, "Yesu ai ni." Jesus loves you. How is the maker of Heaven and Earth kissing his world today? I'm gonna find him. Daily. An elderly woman visiting from the mountains was bound to a wheelchair with painful rheumatism through her whole body. We found her in her daughter’s golden buddha statue shop down in the city. After we prayed for her, she said she had no pain! When we asked if she’d like to try standing, her daughter quickly stopped us. “No, she can’t stand!” exclaimed the daughter. We suggested that God probably just healed her, so the old matriarch stood up from her wheelchair and joyfully bounced up and down with no pain! We explained the simple Gospel and that Jesus loved them very much. They thanked us earnestly as we left. Some days later, I went by the same idol shop and found the daughter, but only an empty wheelchair in place of her mother! The daughter explained that her mom had gone back home. An elderly gentleman was begging for money on the street outside a hotel. He was stooped over, his whole body stiff and bent. His knees were swollen up like large grapefruits, so he walked with a good deal of difficulty. When we laid hands on him, Jesus touched him. His knees shrunk down to become like mine and his legs straightened out! All the pain left his knees and back, and his posture straightened to that of a healthy young man. He now walked with no limp, standing up straight and able to move as he should. A small crowd of roughly twenty people, primarily of a major unreached people group, had gathered by this point. Many of them were interviewing the old man, asking what had happened. He emphatically retold his healing over and over. Those asking the questions would then come to us and ask for prayer. Many people were immediately healed as men and women filtered in and out of the crowd. We explained the Gospel of Jesus and they happily nodded their heads. One senior buddhist lama had been watching all of this happen from the beginning, constantly interviewing those being healed and watching us carefully. Finally he came forward, saying he wanted healing for his ankle. Jesus touched him and all the pain left! We estimate that around 15-20 people were healed in that time, and at least as many heard about Jesus for the first time. A man looks on as the love of God is poured out by the Hindu temple. The discipleship school we were teaching at for the week was forced by threats from radical Hindus to meet secretly in a home. It was outreach day and, ironically, five of us found ourselves at one of the largest Hindu temples in this large Indian city. It wasn’t far from the house where we met in secret. Although the school has frequent outreach for the students, the Indians in our little group had never done this sort of thing before since they were just visiting the school. We saw a solitary sadhu sitting on the curb so we approached him to see if he needed healing for anything. He was mostly deaf and didn’t speak hindi or english, so it was difficult to communicate clearly; but we prayed for him. Afterwards, I looked up and, observing a circle of Indian men around us, announced that God had sent us to that temple because He loved the people there and wanted to heal them. One of the temple guards came forward, saying he had pain. He was instantly healed and was so excited about it that he ran and began bringing people to us who needed healing. People from the street swarmed around us, creating a crowd so large that it stretched out from the temple wall into the road. For approximately the next three hours, countless people were healed instantly. The men came to the pastor and I, and the women went to Laci and the other two women. We would joyfully announce every few minutes that, “Every time somebody is healed, it is a sign to you that Jesus loves you!” and preach a simple Gospel. For hours men and women were being instantly healed of all kinds of things. One man had his cataracts removed, another woman was delivered of demons that were keeping her from being able to touch the ones she loved. Some people were even calling their friends and family to come see what was happening and receive healing. The name of Jesus was being exalted above every other god! I lifted my gaze from those immediately in front of us and saw a mass of dotted faces earnestly staring at us, pressing in to be healed. A man from the street was forming them into lines. If we tried to lay hands on each one, we would be there until night! I stepped up to the tall curb. “If you need healing in your body,” I called out, “raise your hand.” Many hands went up. “Hold your hands out in front of you. We are going to release healing over you and Jesus will come and heal you!” The crowd collectively held their hands out and we stretched our hands toward them. “In the name of Jesus Christ, be healed! All pain leave now, all sickness leave now!” They began moving their bodies, discovering how Jesus healed them. Smiling faces began happily wobbling from side to side in appreciation. Many hands immediately went up testifying to their healing. We preached the gospel again, declaring removal of sin and friendship with God through Jesus’ work on the cross. Again we exalted Him above every other god, saying that He is the only one that loves them and is the only one with the power to take away sin, then lead the people in prayer of salvation. It looked as though almost as many as had been healed also received salvation! ! The people kept asking if we would come back the next day, so we did. We came to that temple for three consecutive days, with what we estimate to be hundreds of people being healed, saved, and delivered. Crowds came each time, hungry for Jesus and what He brings. The sick were being brought to us from as far away as 60 kilometers. Bless God! About a month ago, we received a call from a friend who knew someone who was sick with tuberculosis and she wanted to know if we would like to go to the hospital and pray for him. A thirteen-year-old boy from a minority group deep in the country, orphaned and far from extended family, totally poor and stricken with tuberculosis throughout his entire body, was rescued and brought into the city hospital by some local believers who couldn’t stand the idea of doing nothing to help him. For us, there was no question: we were going and as soon as possible. Eager with anticipation, we walked through the dirty flickering-florescent lit tuberculosis ward, guided by our friends who had spent the past 48 hours caring for someone they barely knew: sleeping in his room with him, bringing him food, etc. We entered the room, masked to keep the air in our lungs free from airborne diseases. The boy was shocked and shy, unable to look anything other than totally frightened and embarrassed by our presence. He may have never seen a foreigner face-to-face before in his life: especially not one with a red beard and freckled skin! We hung out for awhile and talked with him before praying for him. When we laid hands on him, we commanded the disease to leave and the pain to go. The pain in his back immediately left! We agreed to come back that week to visit him again. We returned a couple days later and were not surprised at all to find out that he was completely pain free! There were still no doctor’s reports available to follow-up on the actual tuberculosis, but we were confident that whatever disease was left was on its way out! The boy seemed much more at ease with us and we were able to hang out much longer than the first night. He shared a room with three other people who likewise had airborne diseases. Two of the men were from the grasslands and we resolved to bring back someone who could speak their language when we came to visit next. The next day, we came again. The boy was sitting up and joking with us; a total improvement from the first day we had met him. We brought a guitar and took turns playing music. The atmosphere of the whole room shifted and people from other rooms were crowding into our tiny space to be in the sweetness of the presence of love. God was throwing a party for the orphaned and ostracized in one of the most unlikely places. Isn’t that just how he is? One of the men from the grasslands was a monk and we felt Jesus highlighting areas of his body that needed healing, as well as details of his heart. We spent some time prophesying over him and his entire countenance changed. God touched his body and the pain that had made it difficult for him to move without wincing for three months completely left! The man could not hide his joy! With confidence, we left the ward, knowing that Holy Spirit had deposited many seeds that would spring into bloom over the next few months in the hearts of all who had experienced his love, most of them for the first time. God is everywhere, and the kingdom is near to everyone. With him is fullness of joy and pleasure forevermore! We observed bullet holes riddling the concrete walls outside as our bus pulled up to the local high school in the Castilla barrio of Medellin’s violent Comuna 6. We were in a bus, which offered some immunity to the “Invisible Boundaries” of the neighborhood. Of the 500 students, many were actively prostitutes or hit men in local gangs and armed groups. This was a special day. The principle had agreed to close class for one hour, and hold a mandatory school-wide assembly in the auditorium in which I would preach the Gospel and the rest of the team would minister to the youth. Luz Mely, the woman who had been ministering in this high school for some time now, seemed to carry a sense of expectancy. Up to this point, there were only 20 believers in the entire student body, but we were believing for great things from God that day. When we walked in the auditorium, the whole team began worshipping God all over the room. The strong presence of the Lord filled the place. As the students began filing in, we cheered loudly for them, prophetically declaring the Father’s pleasure over each one. It caught on, and soon there was an ear-splitting corporate celebration as each student entered the now sacred auditorium. The entire Bethel team then came to the front, where hundreds of students flooded the front for prayer. Holy Spirit moved, bodies were healed, hearts were delivered from years of abuse and neglect. Many students wept as the love of God embraced them for the first time. At least two young men trapped in homosexuality were delivered. One of them was a prominent social leader among the students. As the love of Jesus was poured into his heart, he collapsed in the arms of Ethan, one of our team. Ethan cradled the boy for a long time in his lap as the Holy Spirit delivered him from his past. God came with revival to that school! We found out after that some of the most violent youth in the neighborhood were radically impacted that day. Luz Mely got up in church that weekend and announced that the entire school had come to Jesus! She had been on the phone with many parents over the weekend. They had been asking, “What happened at school Friday? My kids came home crying!” The violent ones had become peaceful! Many of the youth are now attended the church there, and there are plans to plant multiple cell groups in the barrio among the youth, and to send buses every weekend to bring them to church.